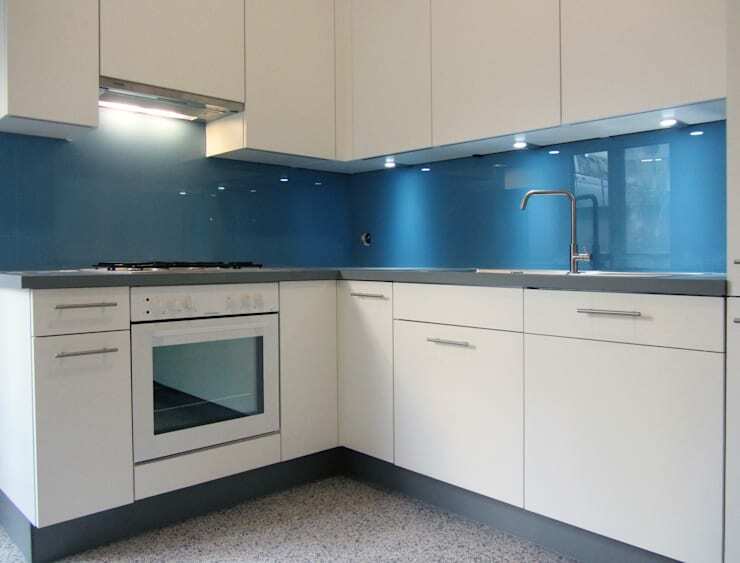 Choosing the right colour and material for your kitchen is very important! Why? Because your kitchen should be able to withstand a good few years before undergoing any alterations or changes. Thus you want materials and colours that are sustainable, durable and timeless. 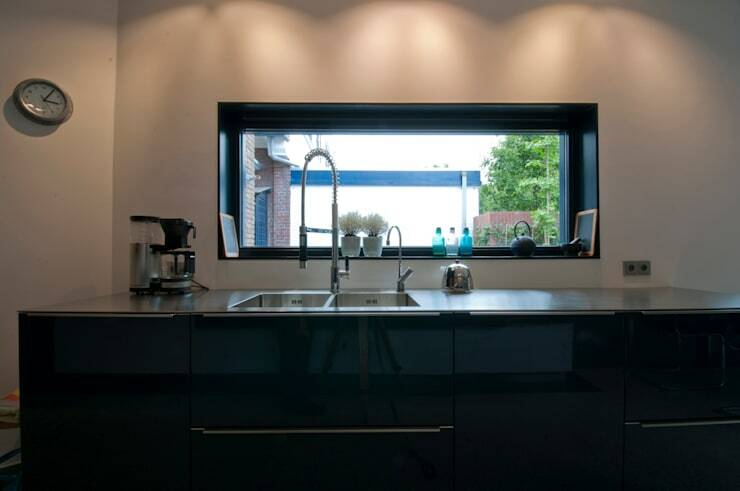 Today on homify, we are going to show 10 different modern kitchens where colour and materials play a very big role. We hope that these inspire you! Who says concrete is boring? 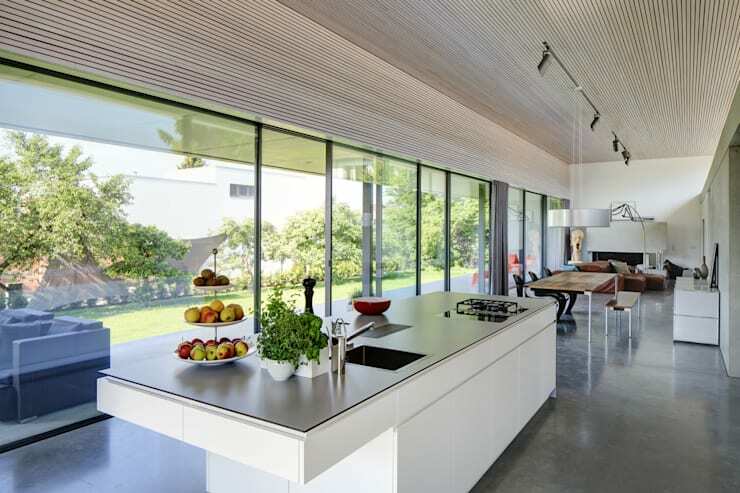 Concrete and glass can create a very stylish, sleek and timeless look and feel. These two materials are ideal for a modern home! Do you see in this design how they create a very sleek and elegant look? These materials also work very well if you have plenty of natural light flowing through the home environment. Don't you love the blue colour? This is definitely an ideal kitchen! The glass across the walls keeps them protected from splashes of sauce or steam, while the blue creates a tranquil design. Do you love a clean and sleek look? 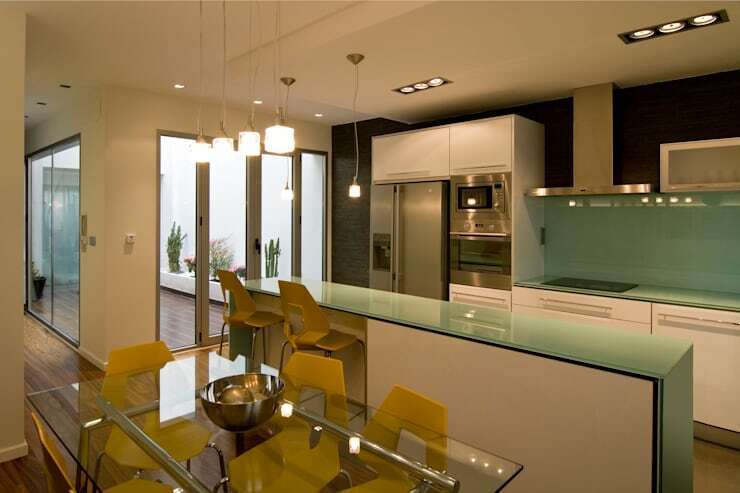 Then this kitchen is the perfect inspiration for you. 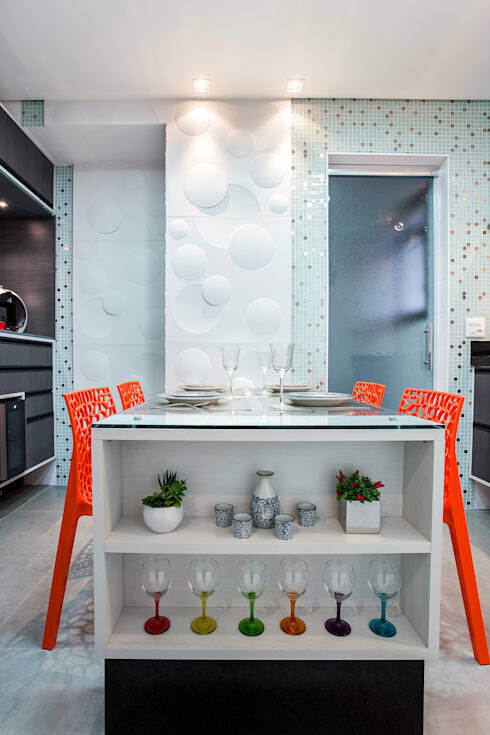 Glass combined with stainless steel appliances and a colourful dining room chairs makes this space clean and modern with a slight minimalist touch. Why is this design so modern? Because of the special materials used and the colour combination! This is certainly not a typical, white kitchen. 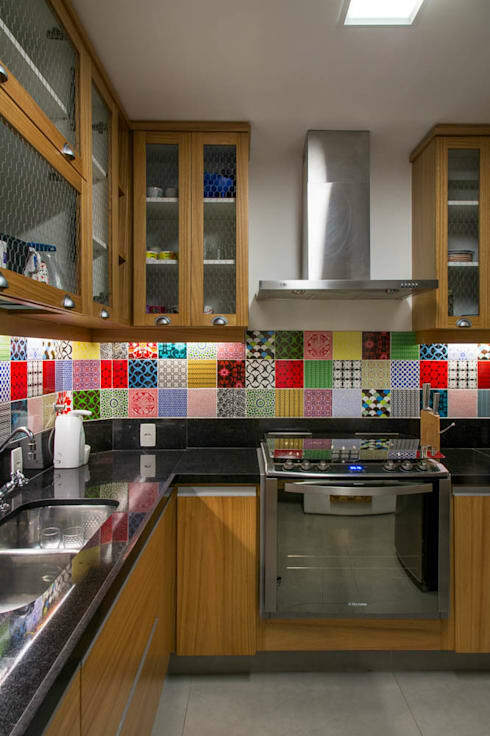 Instead it features playful patterns and striking colours. The tiled walls and red chairs make for a very cheerful design. Don't you love the white wall with the funky pattern? Black is a colour that is not often used in the interior. Why? Because it can create quite a dark and dingy environment. 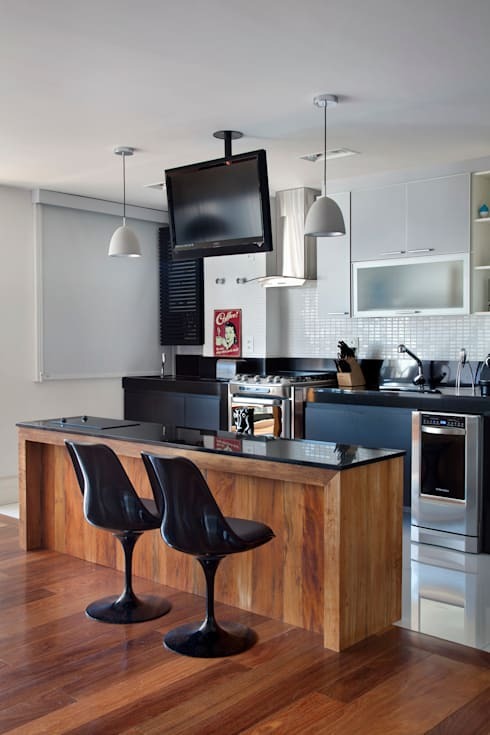 However, if you have lots of natural light in the kitchen or enough artificial light, you can create a very edgy and modern look and feel. If you're a fan of black, don't hold back! Do you like a little bit of colour? They can revitalize your kitchen! Choose tiles to create a beautiful and patterned design. Just remember to think carefully about the design. Do you want an abstract pattern or a floral look and feel? Let your imagination run wild! Wood is the ideal material if you prefer a natural look and feel. Wood creates a very harmonious atmosphere that is durable too! Just remember that wood should well-maintained. Make sure it is polished and sealed. Don't you think it creates a very relaxing and warm kitchen space? Do you love natural materials? Then why not go for granite! 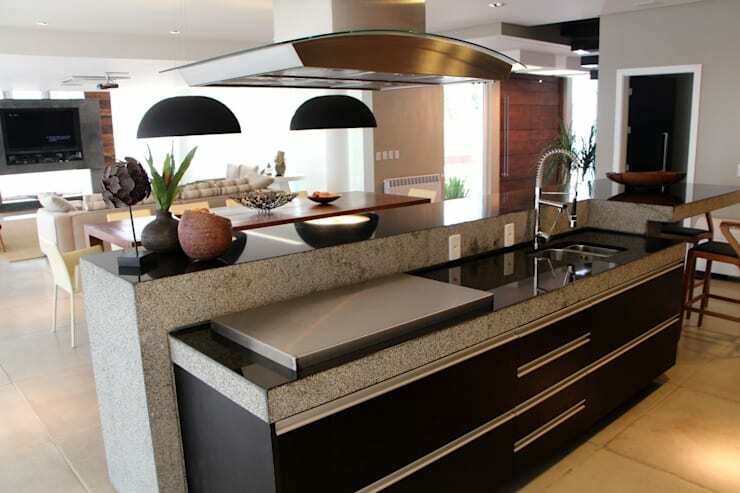 Granite is a durable stone that creates a clean and modern look. If you want a kitchen that will last a life time, granite is a wonderful investment. It also works flawlessly with other styles and materials. 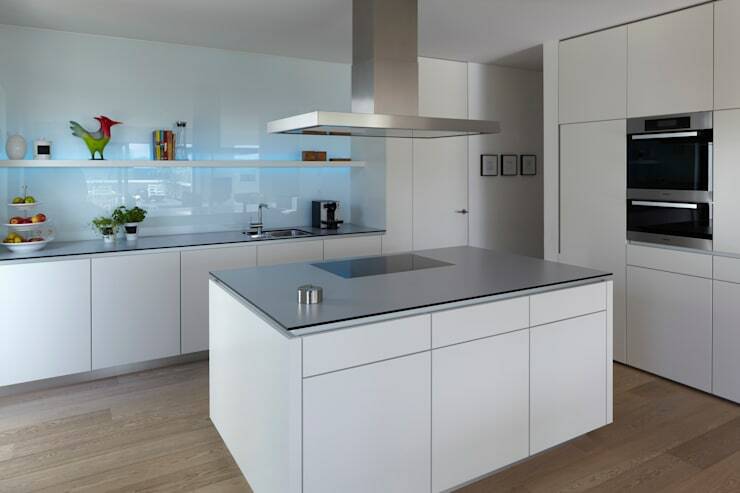 Perhaps you just want a simple, sleek and minimalist kitchen. In this case, opt for white tones and cupboards and drawers without handles or patterns. The result? A very clean and soothing environment. 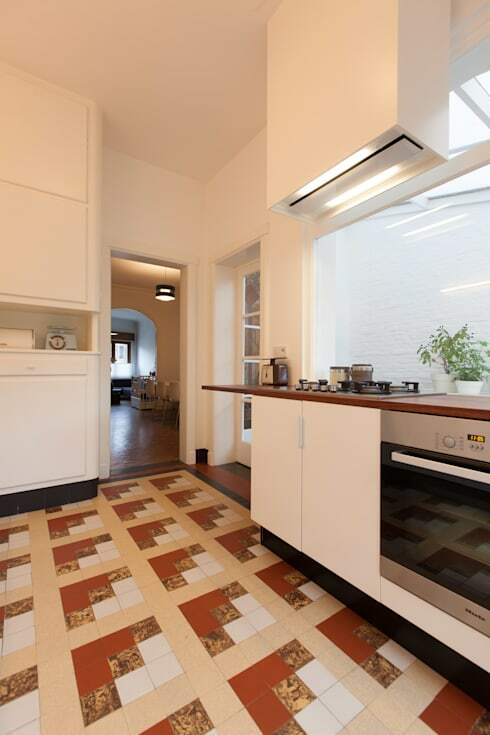 Last but not least, you can also opt for a retro kitchen. Look at the patterns on the floor of this kitchen. This provides this simple space with that gorgeous retro look, which works in harmony with the modern finishes. Also have a look at these 7 ideas for improving your kitchen on a budget. Which materials and colours would you use in your kitchen?